In the photo to the right I have my 0 F (-18 C) down sleeping inside the Bivy. The Pro Bivy provides quick and easy waterproof shelter for one person and their sleeping bag. The Pro Bivy is fairly new to the MSR shelter line up. I found no information on this specific bivy on their website. The 100 Wing provides wind and precipitation protection for up to three people. 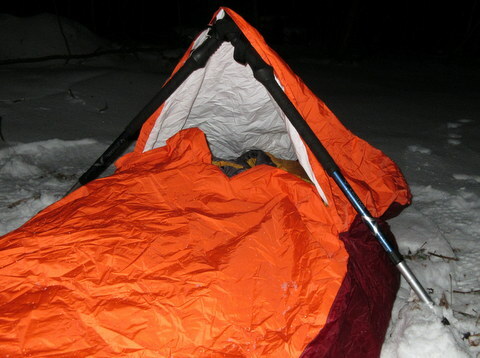 The addition of the Wing to use of the Bivy increases comfort and safety in a heavy rain or snow storm. 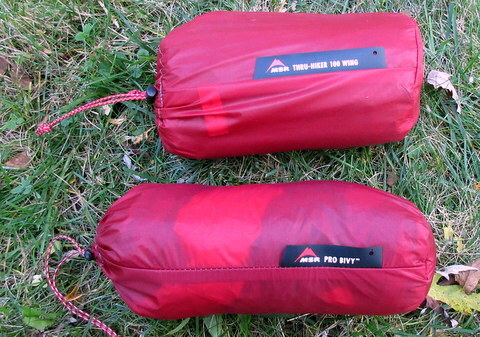 The Bivy and Wing both arrived in good condition inside their stuff sacks. The Wing sack is a little bigger than a 1 L (32 oz) Nalgene bottle. The Bivy sack is a little smaller than that. Both can be compressed even further which will most likely happen when stuffed into my pack. Each has a small black label listing the item in the stuff sack. This is nice as they are identical in color and very close in size. 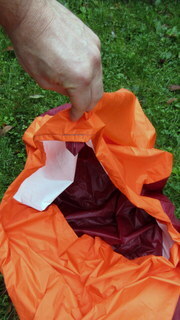 Removing the Bivy from its stuff sack reveals a bright orange on top, red (similar to the stuff sack) bottom and bright white interior. The fabric feels thin but strong. The Bivy by nature is a rather simple thing, basically a waterproof, windproof bag to hold a sleeping bag. True to form there is an opening large enough to pass a sleeping bag and climb inside. There is a fairly large "hood" to cover the head and face. There is also a small loop of red fabric at the front, top edge (photo on the left). I assume this is for tying a cord to in order to hold the hood off of the face to make a "porch". This will be more meaningful in the next section. That's it; no zipper, snap, Velcro or mesh. It is made to be super light, quick and easy to use. 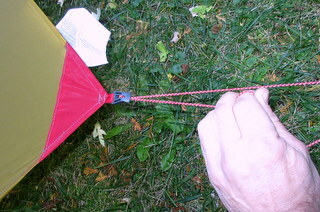 Removing the Wing from its stuff sack reveals a muted gold or drab mustard color tarp with red trim. I also found a second stuff sack containing six stakes. There are tie out cords attached at the four corners and at each pole end of the Wing. 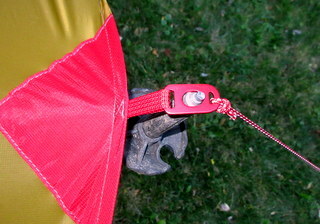 The Wing can be set up using two trekking poles or alternatively tied to trees. 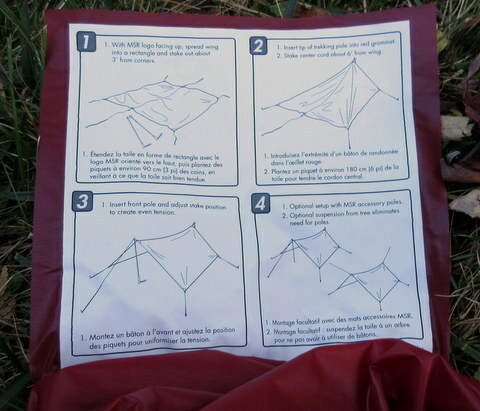 I also notice instructions for setting up the Wing sewn to a flap in the stuff sack, more on this in the next section. There are plastic tensioners at the corners and metal ones on the pole ends. The pole ends also have metal grommets to hold pole tips. 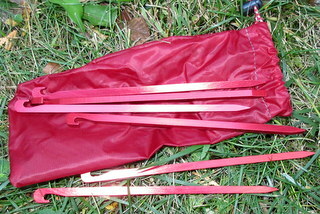 The materials and assembly of the Bivy and Wing look to be of very high quality. I can find no defect in either or the stuff sacks. The color schemes are attractive while being purposeful. 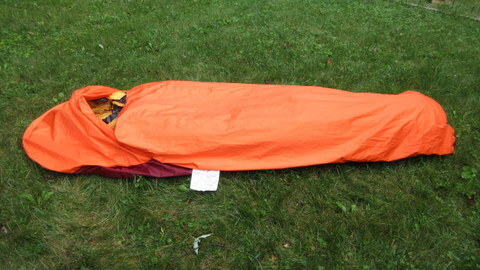 When using the Bivy alone the bright orange would hopefully prevent someone from stumbling over its occupant. The Wing has a more low key color hopefully making it less intrusive in its surroundings. The Bivy did not come with use instruction. It does have a safety warning label attached to it though. The take away message is do not expose the fabric to any flame or heat source. Additionally it advises against completely closing the shelter for risk of suffocation. I am new to using a bivy bag. What to do in the event of heavy rain or snow did cross my mind if not using the Wing. The Wing as mentioned before came with instructions that are brief but clear. They are easy to read and follow resulting in easy set up of the Wing first try. 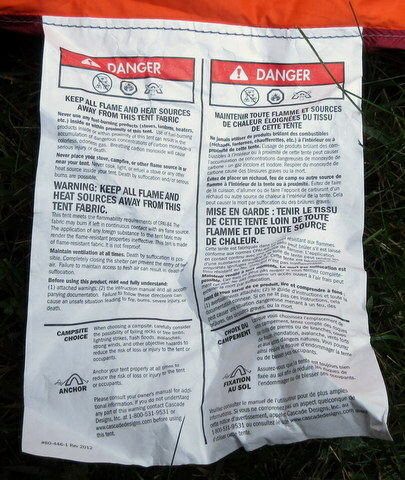 The Wing instructions also carry the same warning against flame and heat source exposure. Both the Bivy and Wing are quick and easy to set up. I set the Wing up first. It took about five minutes. I pushed my sleeping bag in the Bivy and climbed in. I was hunkered down in less than ten minutes. The Bivy could take a little getting used to. Climbing in and out takes more agility compared to just a sleeping bag. And while roomy with space to wiggle the Bivy does have a more confining feeling. When the hood portion is over my head I felt like a caterpillar inside a cocoon. I am not claustrophobic but can get a sense of what it might be like when fully enclosed. The Wing pitched taunt and adjustments were easy. I set it tall and narrow then repositioned the poles to low and wide. It will provide more than ample coverage for a single Bivy. I have plenty of room for my pack and a guest or two for sure. The Bivy rolls and stuffs into its sack no problems. The Wing took more effort to tightly roll and took some squeezing to get into its sack. Maybe with two people folding it and handling the tie out cords would make it easier. Or than again some practice, as this was my first round at it. The Bivy and Wing are sharp looking and well made. All materials and construction appear to be flawless. Set up and use of both together or alone are quick and easy. The two together look to be a good shelter system. I have never used a Bivy before and am excited to do so. 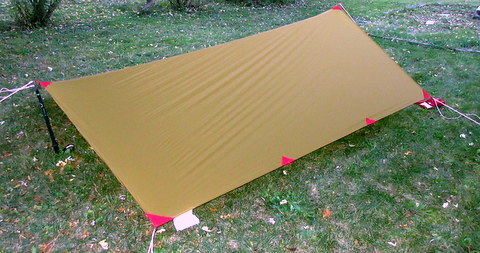 I have used a tarp over a hammock or all mesh tent before so I have some experience siting and setting them up. I plan to use the bivy alone if there is no threat of rain or heavy snow. The Wing will fly if the precipitation does. I look forward to my experience with both. 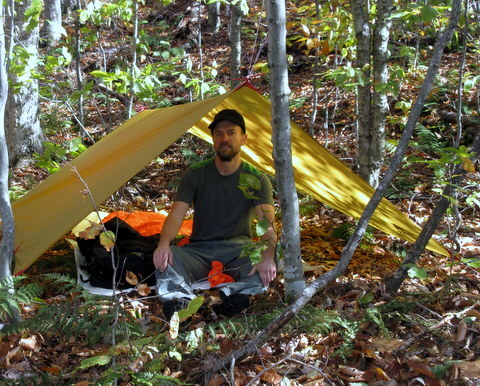 I have carried the bivy and/or tarp on every hike since the test series began. The decision to pack the tarp depends on the weather forecast. If there is a chance of precipitation the tarp comes along if not, it's bivy only. I carry the tarp and bivy as an emergency shelter and thankfully haven't used it. I have used the tarp and bivy on one planned overnight hike and the bivy alone on another. Of all my nights sleeping outdoors I have been in either a tent, hammock or trail shelter (three-sided lean-to). I have never before this test series slept in a bivy alone out on the ground under the stars. It turns out I still haven't as the night in question it was cloudy with sleet and rain. So far I really like carrying the bivy and tarp as my emergency shelter. It packs smaller and is lighter than the tent I have carried prior. As for planned intentional camping the bivy was a small leap, mentally for me. While a trail shelter is open on one side and a tent or hammock provide only the thinnest of barriers to the elements and wildlife, it is a physical divide. Falsely or not it provides me a sense of ease. Just laying down in a bag on the ground seems exposed to me. To transition to this I spent my first night in the bivy under the tarp. The forecast did not call for precipitation but the tarp provided that psychological bubble of a barrier. I planned a short hike with plenty of daylight at the end of the day to locate a suitable campsite. The set up was super quick. All I needed was a small somewhat flat spot. This took about 15 minutes. As a bonus the trees were just the right distance to hang the tarp from. I pitched the tarp high enough to sit up in which allowed the sides to come all the way to the ground. Laying down in the bivy and looking up I felt enclosed in the tarp making this first night out less unusual. I slept in a thin wool T-shirt and long baselayer bottom with a thin polyester winter hat. I used a 35 F (2 C) down sleeping inside the bivy. I slept comfortably through the night. At some point I must have become warm or just restless as I woke with the bivy halfway down my chest. My confidence raised and my worry lowered I set off to overnight in the bivy without the tarp. I hiked to place I know well but even closer to home. Again this was a shorter day to set up an ideal site. The forecast was cool bordering cold but low chance of precipitation. Not having the tarp was interesting. It made setting up camp different as I didn't have such a defined space. There was the bivy and then woods in all directions. But I cooked up next to the bivy while sitting on it. Then loaded everything not for sleeping in my pack leaned it on the tree next to me and burrowed in. I immediately noticed the lack of anything covering my head and face. I pulled the hood of the bivy up and over my head but it laid down on my face. I was able to position it above my mouth and nose to breath. This however left half of my face exposed with no guarantee the bivy would stay in place overnight. I quickly remembered the loop on the bivy hood and some cord I always carry in my pack. I tied a loop to the hood and a nearby branch raising the hood off my face. This created a nice "porch" over my head completely sheltering me. It took me quite some time to fall asleep. While I was inside a barrier I was just on the ground and felt anything could walk up and step on me or crawl in the bivy with me. These thoughts subsided as the fresh air blew across my face and lulled me to sleep. Halfway through the night I startled as something was tapping on my head! I quickly realized this to be water dripping from the branch above. I was very happy that I strung up the hood as it was lightly raining. As the night went on the temperature dropped and the rain turned to sleet. After that first wake up I slept through the night quite well. I woke for a few minor toss and turns mostly from the hood sagging as it grew heavier from the precipitation. I slept in same outfit and bag as before this time adding long sleeve baselayer and thicker socks. I awoke warm and comfortable. The only minor inconvenience was the lower top part of my sleeping bag was slightly damp. I am unsure if this was due to moisture from the outside or condensation from the inside. Now after some comfortable (physical and psychological) successful nights I ventured farther. Once a good cover of snow accumulated on the ground I climbed a more difficult mountain. This was a leap as I was farther from home, the trail was harder and it was colder. With all that said I still planned for a potential bail out. I chose this hike because there is a small cabin located on the summit. If things didn't work out with the bivy I could retreat to the cabin. The hike up was hard but as always fun. There was about 5 in (13 cm) of snow on the trail with some icy spot were the wind blew. I reached the campsite just off the summit and set up camp. This was simply the Pro Bivy on the ground with a 0 F (-18 C) down bag inside on top of an insulated pad with a 5.7 R-Value. I cooked up some dinner, tea and hot water for my overnight bottle. This is a bottle I sleep with in my bag. It helps keep my bag warm while my bag and I keep the water from freezing overnight. On the hike up I pondered the hood of the bivy and how to keep it off my face better. Funny that the solution I found was in my hands the whole hike, my poles! After eating and stowing my non-sleep gear I climbed into the bivy. I wore my long top and bottom wool baselayer, thick winter sock, winter hat and down pullover jacket. The jacket came off once the bag warmed up. Then the "solution" to hold the hood off my face I stuck my hiking poles in the snow to the left and right of the bivy. I brought both ends together making an inverted "V" and hung the hood at the point of the "V". This worked surprisingly well thanks to the snow holding the poles up and me not tossing much through the night. The bivy fabric never touched my face and I felt that if any precipitation fell I was well covered. I slept comfortably through the night. In the morning camp broke down super quick, stuff sleeping bag, deflating and rolling pad and stuffing bivy away. After a quick hot breakfast I was on my way. Removing the sleeping bag from the bivy I again noticed a few damp spot on the top outer surface of sleeping bag. The bivy itself was dry all around. I left the sleeping bag out while I cooked and ate. It was dry when I stuffed it into its sack. 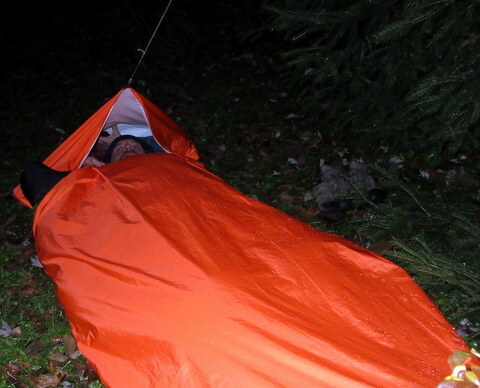 The Pro Bivy is a light, compact and very quick and easy to set up. The 70 Wing is easy to set up and provides excellent coverage. While the bivy has posed a learning and mental comfort curve for me with just three nights in it this has been overcome. I enjoyed the protection from the elements it provides and ultimately the sense of being truly outside that it allows. My last outing with the Pro Bivy and Thru-Hiker 100 Wing was on a three day, two night introduction to mountaineering course. I used a 0 F (-18 C) down sleeping bag and inflatable, insulated pad with a 5.7 R-Value on this trip. The first day out we reviewed equipment, technique and terrain both in and outdoors. I had never used harness, ropes or mountaineering axe before. I attended the course to build on my outdoor and backpacking skills while gaining a new experience. The day was cold but clear and this lasted into the night only with the temperature dropping. Easing into the course the rest of the group stayed in town the first night. I however opted to find a secluded spot near a trailhead and set up the bivy. Using my snowshoes I stomped out a space for the bivy and an area to cook within arms' reach. I planted my hiking poles and snowshoes at the four corners of my bivy spot. I was about 8 in (20 cm) below the top surface of the snow. This made my sleeping arrangement feel somewhat cozier and more secluded. I slept well with only my usual comfort repositioning wake ups. In the morning it was very nice to roll over, light the stove and have breakfast in bed. After eating I dressed "in" my bag and then pulled my sleeping bag out of the bivy. I noticed a mixture of moisture and ice crystals at the foot and head of the bag and bivy. I was able to wipe and knock off a fair amount of the ice. I then turned the bivy inside out and hung it and the bag from a branch. After I packed away the balance of my camp I went on a quick warm up hike. When I returned the rest of the moisture on the bag and bivy had frozen. I was able to wipe off ever more ice and pack everything and rejoined the group. On day two we went right to climbing a few different mountaineering routes and did some technical ice climbing. It was really challenging, fun and rewarding. Around mid-morning it began to snow and snowed the rested of the day and through the night. Everyone stayed out on night two and the snow made it interesting. I stomped out a bivy spot this time in just mountaineering boots. It took much longer and was harder to get an even, flat spot. The snow was deeper now, I was about 12 in (30.5 cm) below the surface of the snow. Before rolling out the bivy I set up the Wing tarp over my bivy spot. I was able to tie the ridge off to two trees and hung it high enough to sit up under it. 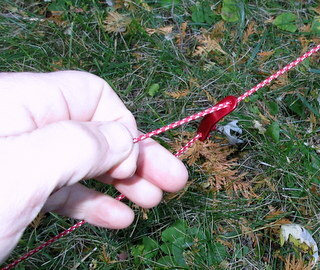 The corners I was lucky to tie three off to nearby trees. The fourth I used downed tree branch to stomp an anchor in the snow. Now with shelter overhead from the snow I rolled out the bivy, fluffed my sleeping bag and inflated my pad. I carved out a kitchen at the back of the tarp and a step down entrance at the front. This was the most fun I ever had making camp. It was really making something not just pitching a tent or tarp and getting inside. Dinner rehydrating and water boiling for the night and morning we talked about the day and the plan for tomorrow. During the night each time I woke to change position I also hit the tarp to knock the accumulating snow off. I stayed toasting and dry all night and woke with less condensation inside the bivy or my bag. The underside of the tarp seemed to be where the moisture collected this time. This was shockingly apparent the last time I knocked snow off and fine ice fell from the inside of the tarp. Crawling out of my shelter I saw the Wing did an amazing job holding up to the snow. The snow piled up and the sides of the tarp were pushing inward. I was shocked to see how much snow had fallen and wished I had dug a perimeter around the tarp to catch the shedding snow. This was one just one of many insights I had over the three days. 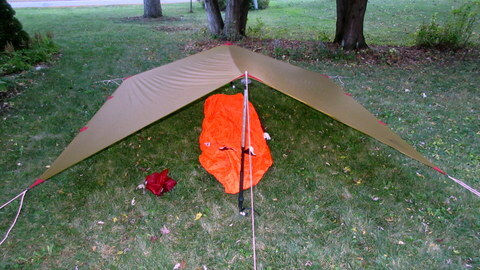 The Pro Bivy and Thru-Hiker 100 Wing proved to be quick, reliable, fun and easy shelter combination. The ability to use the bivy alone or with the tarp allows the flexibility to set up a shelter to best meet the conditions at hand. I haven't had a camp set up faster or easier than slipping a sleeping bag into a bivy sack. The bivy stopped wind and precipitation from reaching my sleeping bag. It did however cause a minor amount of condensation to collect on the sleeping bag. I was able to manage this and was not a problem on one and two day trips. The Wing kept me well sheltered while camping in a snowstorm. It also made me feel sheltered providing a barrier to the night outside. That said it was very fun to sleep in the Bivy directly on the ground. I had a sense of being outside I hadn't before. Both the Bivy and the Wing remain in like new condition. While they spent most of use their use in the snow, it can be wet, frozen, abrasive and heavy and both the Bivy and Wing held up well in these conditions. Of all the outdoor sleeping experiences I have had I like a clean trail shelter in a cool location most. My next choice is a lightweight tent. I really like my learning to use and my experience with the Bivy and Wing. However I think I will carry the Bivy and/or Wing for emergency shelter or back up when the trail shelters are less than desirable. This concludes my Long-Term Report. I would like to extend my appreciation to Cascade Design Inc. and BackpackGearTest.org for making this test possible.